Waterville, Maine was named after its prime location on the Kennebec River and was incorporated in 1802. Located about 18 miles north of Augusta, this is a popular four-season vacation area. A long-time mill town, Waterville is now an industrial, commercial, and academic community. 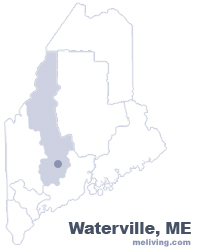 Waterville is the principal trading center for this region of central Maine. Prior to the arrival of the white man, the Abenaki Indians held tribal councils at Ticonic Falls.U.S. Senator Edmund S. Muskie began his political career as an attorney in Waterville and was elected the Maine legislature in the 1940′s. To share any Waterville, Maine information with us, please contact us. Learn more about advertising in MELiving.